Neerja Pande is a Professor in the Business Communication Area at Indian Institute of Management, Lucknow. She has more than 27 years of rich academic, administrative and research experience in premier national and international institutions. 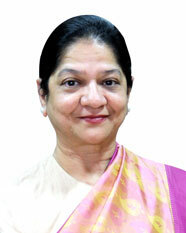 She is credited with establishing the Communication Area at IIM Lucknow in 1999. Dr. Pande has been associated with European School of Management Paris, Fergusson College Pune, Lucknow University, IIM Ahmedabad, Calcutta, Indore, Rohtak, Raipur, Ranchi. Sirmaur and Jammu amongst many others as full-time or visiting faculty. Her two-year assignment as Director, Jaypee Business School, run under the aegis of a ‘not for profit’ trust, was a highly challenging and satisfying experience. Dr. Pande loves reading classical literature, philosophy and listens to Sufi music in her spare time. Dr. Pande is credited with publishing high quality research in internationally acclaimed category journals in the area of mindfulness, leadership, corporate communication, and persuasive communication. She has actively participated and presented her research in various national and international forums including ‘Association for Business Communication’ conferences held at Switzerland, USA and India. Her ‘Special India Edition’ Coauthored book ‘Business Communication: Making Connections in a Digital World’ with McGraw Hill is a highly successful book prescribed as text book in number of IIMs and premier institutes of the country. Dr. Pande has the distinction of running some of the most sought after electives on ‘Persuasion’ and ‘Leadership’ in the IIM system. One of her own favorites’ is ‘Leadership through Literature’ an elective which aims at creating perspectives on leadership through literary pieces that bring out human character and its various complexities. The course is based on classical literature such as Siddhartha by Herman Hesse, Othello by Shakespeare, My Experiments with Truth by Mahatma Gandhi amongst others. Some of the other courses that she teaches are: ‘Advanced Oral Communication’, ‘Written Analysis for Communication’ and ‘Communication for Management’. A national scholarship holder and a UGC scholar she earned her Masters and Doctoral degree from University of Lucknow, India and also holds a Diploma in Journalism. She became a Harvard affiliate in 2010 when she went to attend the Global Colloquium on Participant Centered Learning at Harvard Business School, Boston. Dr. Pande has successfully conducted numerous Management Development Programs for Executives on ‘Effective Communication for Managerial Success’, ‘Corporate Communication and Image Building’, ‘Advanced Communication Skills’ and ‘Leadership Development in Women’ for both public and private sector organizations.